Alaska Baby Rentals is an authorized retailer of Bumbleride & we have new strollers and accessories in stock! We are excited to offer a Try & Buy Program for Bumbleride. Listed below is only a partial selection of our Bumbleride product offerings. We are proud to offer an Alaska resident and a military discount. Contact us for details. Don't see what you're looking for? We carry more products than are listed on our website. If we don't have it in stock, we can order it for you. Have more questions about Bumbleride or our Try & Buy Program? Contact us and we'll happily answer any questions you may have! Product details and specifications are available on our products page or visit www.bumbleride.com. Want to try a Bumbleride Stroller before you buy one? Check out our Try & Buy program! 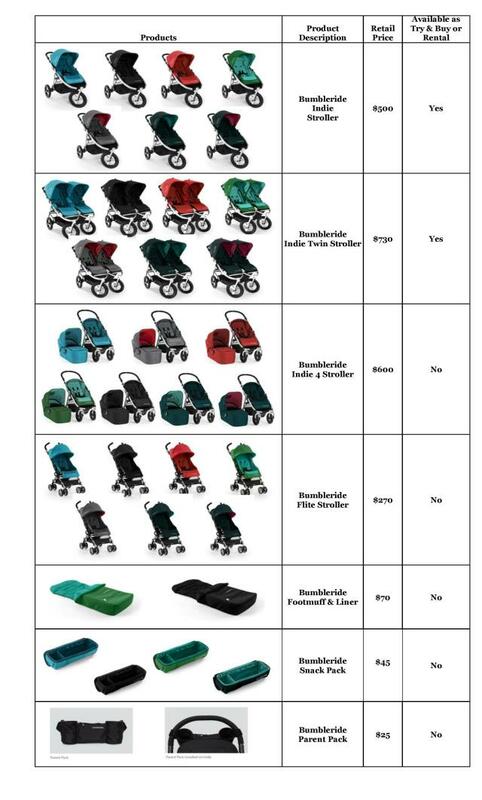 Rent a Bumbleride stroller and if you decide to purchase, Alaska Baby Rentals will apply the price of your rental towards your purchase. Super simple and easy!